Intense, ripe orchard fruits, lingering finish….. 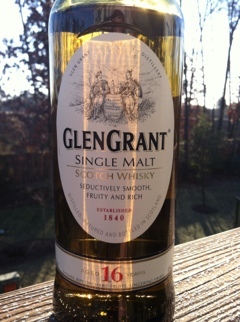 These are the words imprinted on the bottom label of the lovely bottle of Glen Grant 16. After you drink a lot of whisky (variety, not quantity) particularly scotch, you do see the finer scotch whiskies have a distinctness about them and within their own line each one acts differently. Glen Grant is a newcomer to the States and has a long history with a few owners, originally family, but since the 1970’s corporate ownership has dominated. It is a line of whisky started in 1840 in Rothes, Speyside, Scotland in the UK and was most noted by it’s second owner James Grant who at the ripe age of 25 became its purveyor and visionary. Now corporately owned, it has been introduced into America with a 10 year and a 16 year offering. I tasted both of these at the SMSWA event in Washington D.C. this past fall and really liked them. I thought the 10 to be a great entry or starter scotch for someone and the 16 to be a scotch truly enjoyed by those who imbibe scotch regularly. Recently I found a bottle of the 16 available in DC. I snatched it up, despite its $70 cost because I am so desperate for variety of scotch and I do remember it being good, $70 good….not so sure, but like I said, desperate for variety. When nosing this, you do notice a very clean fresh fruit nose. It’s a very bright and cheery nose, quite enjoyable. The affect on the tongue is equally refreshing! Mouthfeel is just right, a bright burst of fruit and alcohol hit you mid-palate but do not overwhelm. I would say this is a very young acting 16 year old. Much like a teenager but fully developed no doubt. I think this same spirit aged a few more years would be incredible. But fruit is forward, and very refreshing in this whisky. I’d say this would be great with strawberries or something tart like kiwi. The finish is very nice, lingers, and really makes you want more. Being that my relationship with this bottle is new I don’t know quite how to feel about it. I do feel it has a special place though. The more I try it, the more I like it and feel this would, though great now, is strong enough to age at least four more years. I really think I have found a new favorite scotch! And if you were wondering about cigar pairings, I would not pair this with more than a mild-medium cigar. You really are not going to find a cigar with flavor to match this one so keep it mild so the two do not clash. I’d recommend a smooth Davidoff or Montecristo with this one. If you are paying for this bottle and smoke cigars I’m sure you are not a stranger to those names. I like this one quite a bit, wish it would get more press. Or maybe not if I want to keep prices from exploding. I like the simplicity-yet-something. I like that it doesn’t have any obvious peat or sherry (even though I love peat but the Islays have that covered). I like that it doesn’t have any of the disgusting plaster taste I somehow find in Glenfiddich and Balvenie. But I love that it still has a lot of flavor beyond all that stuff, unlike say Oban. Not quite the finish you’ll find in an Old Pulteney 21, but that’s double the price. I haven’t seen this whisky in awhile in my market but hope to find it again. I remember it still being very nice! Cheers!